Here are the preliminary changes for the Saboteur in 1.8, with the goal of making the Saboteur a competitive AOE DPS soul. 1) Soul Points have been reset. 2) All Saboteur Charges can no longer be parried/dodged/blocked/deflected. 3) High Explosives: Functionality has been changed. Your Fragmentation Bomb, Time Bomb and Annihilation Bomb cause the target to bleed for 10 seconds. Stacks up to 3 times. 5) Combined Arms: New talent. Your Fragmentation Bomb detonates all Charges on the primary target. Existing Combo Points on the target triggers Shrapnel Bomb, dealing Physical damage to surrounding enemies. 6) Charge Booster: Functionality has been changed. Increases the damage bonus from Attack Power of your Charges by 10%. The damage bonus from Attack Power is increased by 3% for every point spent in the Saboteur Soul above 21. 8) Trench Warfare: New talent. Increases the damage bonus from Attack Power of your Detonate, Bombs, Traps and Land Mines by 10%. The damage bonus from Attack Power is increased by 5% for every point spent in the Saboteur Soul above 26. 10) Combat Wounds: New tier 4 talent: Increases the damage of Spike Charge and Caltrop Charge by 15/30%. 11) Bomb Specialist: Now also reduces the energy cost of Bombs by 1/2/3/4/5. The damage of Bombs is increased by 5/10/15/20/25%, up from 3/6/9/12/15%. 12) Demolition Specialist: Functionality changed. Now a 1 point talent. Your Annihilation Bomb detonates all Charges on the primary target. Existing Combo Points on the target triggers Shrapnel Bomb, dealing Physical damage to surrounding enemies. 13) Caltrop Charge: Functionality has been changed. It now causes the target and surrounding enemies to bleed over 10 seconds when detonated. 14) Spike Charge: Duration of the effect is increased to 10 sec, up from 9 sec. DOT interval is now every 2 sec, down from 3 sec. Damage has been adjusted. 15) Splinter Charge: Now deals damage and applies debuff to the target and surrounding enemies. The value of the armor debuff has been increased. Lasts 12 sec per Charge. 16) Embers Charge: Now deals damage and applies debuff to the target and surrounding enemies. Lasts 12 sec per Charge. 17) Chemical Bomb: Duration of the effect is increased to 10 sec, up from 8 sec. Damage has been adjusted. 18) Improved Chemical Bomb: New 2 point talent introduced at tier 5. Increases the damage of Chemical Bomb by 15/30%. 19) Improved Entangling Trap: Moved from tier 5 to tier 4. 20) Carpet Bombing: Cooldown reduced from 2 min to 1 min. 21) Rapid Setup: Cooldown reduced from 1 min to 30 sec. 22) All traps, except Land Mines, now no longer have a cooldown. 23) 2 Piece HK Synergy Crystal: Functionality has been changed. It now increases the damage of Blast Charge and Spike Charge by 30%. 24) 4 Piece HK Synergy Crystal: Functionality has been changed. It now increases the damage of all Saboteur’s AOE abilities by 15%. Last edited by Ailion; 03-26-2012 at 01:14 PM. I like the fact that bombs and charges are both useful now, but there are still some major issues. - Sab's DPS has taken a significant hit, particularly in single target. I know this is not the focus of the soul, but I assume it's ST DPS should be comparable to Stormcaller, and it's quite far behind. - Sab is extremely energy starved. - The AE rotation is now longer than before (15 secs). This is much longer than the ramp up time for other AE souls, and makes Sab hard to use in most situations. A small quality-of-life fix, like "Dead Man's Switch: If your target dies, charges automatically explode" would be much appreciated. - Combined Arms seems useless. Last edited by Beckmann; 02-17-2012 at 11:39 AM. Unless it was fixed very recently, on the PTS charges detonated by bombs would benefit from the Deadly Dance buff without consuming it. Ain't no one gonna use traps still. The 6s HE bleed on bombs seems a bit awkward and underwhelming. I see that the OP here mentions "target" - if it's no longer even AoE, it's effectiveness seems pretty marginal. Even spacing this out to an 8-10s bleed would help, particularly in light of the other energy issues. The change to High Explosives forces us to use bombs in rotation which is fine since it makes the rotation more varied. However it makes the rotation extremely slow since a base rotation then consists of 5 charges, a bomb and a finisher and all this with no reduction in energy cost. The whole thing takes around 7.5 seconds even with fervor. Combined with the DoT nature it means that the damage is very slow to apply. The two main purposes for aoe soul are to kill lots of small stuff quickly and to aoe various adds in a bossfight. For the former purpose saboteur fails badly by never having enough time to do any damage at all. For the latter saboteur is more suited for but the dps output just isn't there on live or on pts. 1. Shorter rotation. It's just too slow, it needs at least 2 seconds shaved off the base rotation to work. 2. Some aoe ability that can be applied immediately without a long setup time, the traps don't really work since they require you to run around placing 1 second cast time traps. 3. More damage. Saboteur parses well below what an aoe soul should be parsing. Splinter and embers debuffs last 30 seconds and each one takes a full 5 charge rotation to apply to a reasonable effect. This is again too long to be practical. I would suggest to change the functionality so that each charge gives the full debuff and the amount of charges affects the duration of the debuff instead. I would say 12 seconds per charge or so would be good. Some good stuff in here. But also lacking a lot. Are these most of the changes? Or are there more incoming for sab? These look good, but highly doubt it will be enough to compete with other classes AE. Maybe on trash pulls. But on boss fights, most adds you have to kill don't have nearly enough HP. So by the time you can actually get ramped up, they will be dead. No point in even using this sort of spec on a fight like that at all. Unless said adds have like 4mil + HP on a boss fight, so you can actually get rolling with these rather long rotations. And can we please get AP modifiers equivalent to what warriors are getting. Almost every AP modifier they are getting is 200%, where as we are getting 70% total to charges if going 51 sab only. Because our GCD is 2/3rds theirs, we should be getting 133% ap bonuses normalized, but then you have to factor that warriors gain .75AP per str and can stack str and AP for higher net AP than rogues can receive, so to compensate we should really be normalized around 150% AP contribution base to scale equivalently, even if that means lowering base damage a bit so we don't become OP. Because our GCD is 2/3rds theirs, we should be getting 133% ap bonuses normalized. Personally, I hate how AP/SP bonuses are additive instead of multiplicative. It just seems like poor scaling by design -- eventually base damage will be irrelevant? Just make AP/SP bonus a multiplicative one and leave it completely alone -- normalized across all callings. Use base damage primarily and I think this would really help scaling across gear levels. 1) Setup time AND subsequent time to achieve the AE damage due to bleeds being over time. 2) Energy issues/damage issues. Not enough energy/damage. 3) Been brought up a few times but I feel it is necessary: Dead mans switch/trigger. Since Sab charges do no damage on application, potential dps can be lost as enemies die. No other calling or soul has this issue. Sab is unique in this issue and it can be solved by having all charges placed on an enemy who dies, explode/effect the nearest enemy/enemies. This is the only way that a Sab won't both lose energy AND dps if a target dies while setting charges on them. 4) Tying it all together you get: Large setup/ramp up time, less payoff than other AE souls damage-wise, energy starvation, and no "crem-de-la-crem" AE damage dump. Stormcaller and forked lightning. It's applying a debuff as well as doing the damage when cast. Mana-wise they can keep this up about 5-10x longer than a rogue becoming energy starved. In the process, they are also building charge for a big finisher. This finisher will consume their charge but will provide additional heavy AE damage. Stormcaller 51 point ability provides HUGE AE damage. While over time, this ability is the pinnicle of AE damage or darn close to it. If Sab is supposed to be an AE soul, competitive to other AE souls, at the very least, a 51 point ability that would provide heavy AE damage (even if certain conditions had to be met first) would provide that competitive edge that Sabs would need to be on close to equal footing. Ramp up vs. instant damage would lead me to conclude that after the ramp up, the damage would have to be greater than the instant damage. If not, the instant damage would win in all scenarios due to the zero damage dealt during the ramp up. This could always potentially be the case due to bleeds happening over time, which can cause issues with clipping, or enemies dying while still having a large amount of bleed time left on them when they die vs. the instant damage occurring.... Instantly. Ok, I think I've found a use for Combined Arms. I'd need to test different finishers and see what actually worked well. Last edited by Beckmann; 02-17-2012 at 01:10 PM. Keep on going like that, then use a Frag bomb to detonate a pair of blast sets. I need to take a gander at particular rotations and energy starvation, but I wouldn't be surprised if some sort of sabdancer build doesn't pop back up. Last edited by bitnine; 02-17-2012 at 02:04 PM. I still dont see sab being a competitive aoe build if we are looking across all callings. Also I think "Dead Man's Switch" is the single greatest idea brought up during all of this sab talk. It would be a shame if it didnt get added to our changes. It would solve a huge problem with dps loss. Last edited by Chucknorris405; 02-17-2012 at 02:12 PM. So I just did a bunch of testing, and maybe I'm missing something obvious, but I can't get Deadly Dance to get consumed on loading charges. And the BD AP bonuses do not work on charges. So the 13 BD route wasn't useful. I tested a bunch of different support souls for 44 Sab, and the conclusion is basically that 20 Sin is still far and away the best. Sin is giving 8% free DPS from poisons and Serrated Blades, as well as buffing the charges which are the majority of DPS. Unless the charge/poison synergy is killed, I don't see anything displacing Sin. To be completely honest, I can't explain why Final Blow should do better than Detonate. It actually does less damage (tooltip and on dummy) than Detonate, so single target there is no reason NOT to use Detonate, unless you can make a good build with Annihilate or Deadly Dance for a secondary effect from the finisher. Of course, in AE you still don't want to Detonate every other rotation so you can use Annihilation Bomb to spread Spike. So I guess my conclusion is that I still don't see a compelling use for Combined Arms. Need to find a finisher that beats Detonate somehow for it to be useful. Last edited by Beckmann; 02-17-2012 at 02:46 PM. Sabo willl never be competitive with other AOE souls as long as it it both bleed based and backloaded. This is why it's a terrible soul. It could be possible, but in order for that to happen, the backload would have to be > other callings damage that do not backload. Enough to make them even over a certain amount of time. Of course this will never happen, so overall I agree with you. Bleed damage would have to either ramp up over time or start high and go lower over time to allow for a curve instead of flat delayed/over time damage. In almost every fight, you want adds burned as soon as possible. Sabs will not provide that currently or even with the changes. A good point of comparison would be to compare BD AE with compound plus twin with deadly dance, and fan out spam. At what time point would Sab AE beat out those AE. And by how much? Currently on pts sab is like 10% more aoe dps than fan out spam. If we assume 5 second setup time for sab then it will take it 50 seconds to catch up to fan out. BD does more aoe than sab so it's not even a question when sab catches up to it. 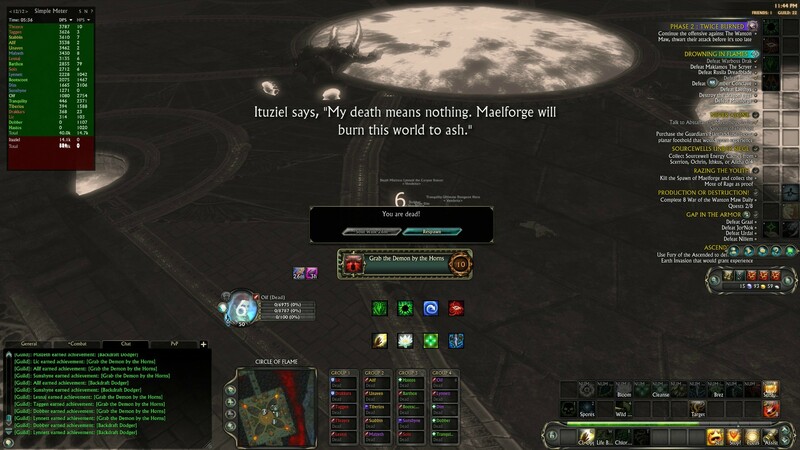 Sab is only suited for fights where there is a central target like matron zamira for example with adds spawning and then they get aoed along with the main target. Any fight where you would actually have to target an add is a lost cause for sab. Maybe sab needs a mechanic a bit like cabalist has where we would gain a charge once per second, then when a charge is placed on a target it would place all the accumulated charges and give as many combo points. That way bombs could be used without slowing the rotation since using a bomb would give one more second for charges to stack up.